WriteOnCards.com is focused on producing the highest quality, most versatile referee cards available. If you’re like me, you don’t use just any whistle, or just any set of flags. You choose your equipment carefully, and expect it to perform flawlessly so you can keep your utmost attention on the match. You also want to project an organized, professional image. That’s why WriteOnCards.com was created. Since 1997, a special matte finish laminate gets applied to our cards that you can write on with anything — pen, pencil, permanent marker, and in any weather. We constantly scrutinize our card layouts for efficient use and critical information storage. 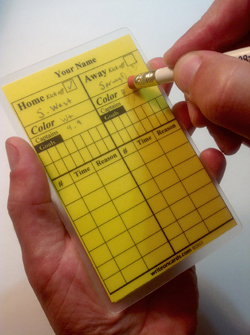 Our cards have been fine-tuned by the special suggestions of referees from around the world. However, no single card design is perfect for every referee’s preferences. So we offer fully-customized cards, created exactly to your specifications. Different color? Different size? Different layout? No problem. Need 300 customized sets, fast? Just let us know. Our catalog of card designs are the result of input by officials like you from the USA, United Kingdom, Australia, Ireland and more. As it has been since the beginning… our products are still “made by a referee, for referees”.